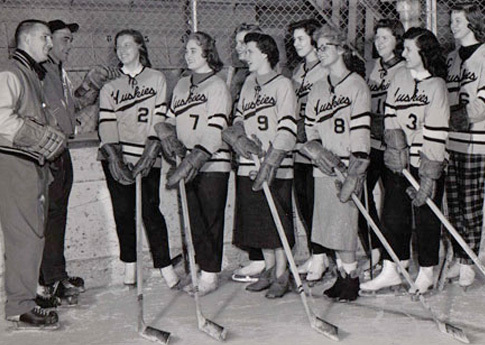 The first Face Off Fracus which was put on by Phi Lambda Beta sorority with opponents from the Inter Fraternity Council in 1958. I only have the scanned photos now. My originals were in my scrapbook which is now at the Alpha Gamma Delta house. The large pictures were taken by the Lode staff, I believe. 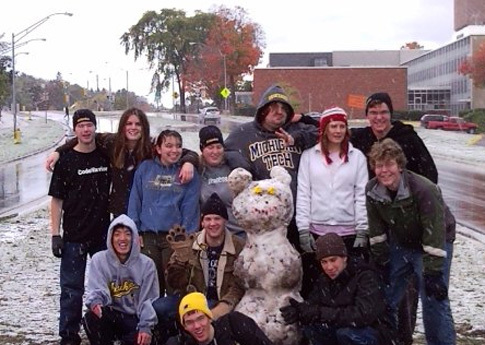 This was my first year at Michigan Tech, and I lived in Citadel in West Wads. Our group is the research scholars and Honors Institute kids. In October, for the "first snow" of the season, it was a Saturday. A bunch of us all got up pretty early--it was around 8 am--and went outside to play in the snow. We threw snowballs (oops! ), made snow angels, and decided, upon noticing more snow in the open areas, that we would attempt to build a snowman. Now, it being the beginning of October, and being that there was almost no snow at all, the snowman didn't turn out so well--it was pretty dirty, and it took a long time to find enough snow for the whole thing! The dirtiness of the snow brought about the snowman's name--the Dirty Polar bear. I had so many good times with my hall this year, and I guess, above all, I'd just like to thank them all for that! I not only remember this—I was the chairman of the committee that organized what I believe was the only student strike in Tech history. There are more pix (but no real narrative) in the 1972 Keweenawan. And the time frame was late April or early May 1972, not 1969 or 1970. You can tell by the construction work in the background on the mall—the sidewalks and landscaping—which was not started until the MechEng building was completed. The protest was directed at a renewed bombing campaign against North Vietnam and it was part of a wave of anti-war campus protests before the 1972 election. In 2009, my friends and I lived in Junkyard, and we were a very close hall. At the beginning of the year, we somehow got the idea of building cardboard armor. We all went down to the basement of DHH and spent hours putting our armor together- we had everything from cardboard boxes with holes cut into them to jointed suits which would flex when you wore them. After we built our armor, we went to the park in Hancock to have a cardboard battle in our armor. 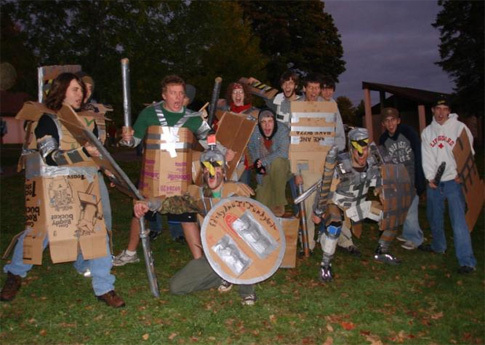 This is a picture of my friends posing in their armor before the epic cardboard battle of 2008. 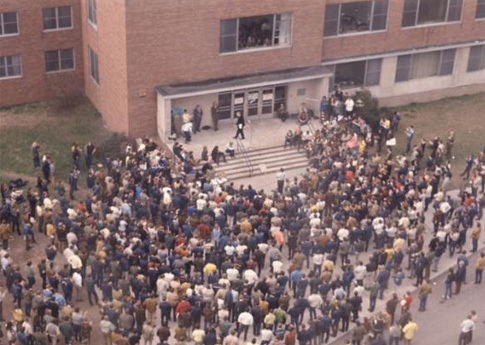 Share Your Memories - Are you a Michigan Tech alum? Tell us your story. Information - Are you a Michigan Tech alum? Tell us your story. Photo & Confirmation - Are you a Michigan Tech alum? Tell us your story. I am the owner of this image and authorize full usage rights to Michigan Tech. I authorize Michigan Tech to reuse this memory in other University communications. Thank you for sharing your memory with us. After it's approved you will receive a notification email at the address you provided. Then, come back and share your memory on Facebook and Twitter! which includes providing equal opportunity for protected veterans and individuals with disabilities.